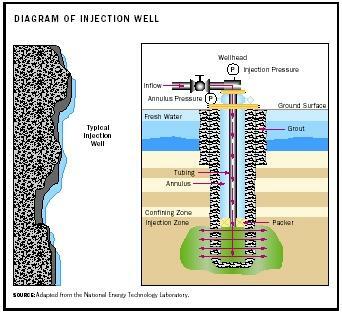 Injection wells use high-pressure pumps to inject liquid wastes into under-ground geologic formations (e.g., sandstone or sedimentary rocks with high porosity ). Many geologists believe that wastes may be isolated from drinking water aquifers when injected between impermeable rock strata. However, injection wells are still controversial and many scientists are concerned that leaks from these wells may contaminate groundwater. As of 1994, twenty-two out of 172 deep injection wells contaminated water supplies. There are five classes for injection wells based on the type of fluid injected and the location of the wells. Class I wells inject hazardous or non-hazardous fluids into isolated rock formations, approximately four thousand feet below the surface, and are strictly regulated under the Resource, Conservation and Recovery Act (RCRA). Their use must demonstrate that underground drinking water sources won't be contaminated. Class II wells are commonly used for the disposal of brine created during oil and gas production. Class III wells inject superheated steam or fluids and then extract them from the geologic formation to remove valuable minerals. Class IV wells were used for injection of hazardous or radioactive wastes, but are currently banned in the United States due to possible contamination of shallow drinking water sources. Class V wells (those not included in Classes I–IV) inject waste into the ground and allow it to drain by gravity into shallow aquifers , providing little or no protection against groundwater contamination. Examples include drainage wells, septic tanks , and cesspools . The Environmental Protection Agency (EPA) estimates that over 400,000 injection wells, receiving nine billion gallons of hazardous waste annually, exist in the United States. As of 2002, there were 473 Class I injection wells of which 123 were used to dispose of hazardous waste. Lesserdeveloped countries (e.g., Mexico) also use injection wells for waste disposal and often have fewer regulations than the United States. In the United States, injection well casings must provide double containment to compensate for any structural failure. Wells are tested every five years for integrity (more frequently for hazardous waste) and are monitored continuously for possible contamination. Because of the threat of contaminating underground drinking water sources, the EPA establishes minimum requirements for the location, construction, operation, maintenance, monitoring, testing, and closure of injection wells. All such wells require authorization or specific permits. Although some believe that properly constructed and operated injection wells are an environmentally sound disposal method for hazardous waste, fractures in rock layers often allow drinking water sources to become contaminated, and the ultimate fate of injected contaminants is unknown. SEE ALSO H AZARDOUS W ASTE ; R ESOURCE C ONSERVATION AND R ECOVERY A CT (RCRA) ; W ATER P OLLUTION . Adapted from the National Energy Technology Laboratory. Spellman, Frank R., and Whiting, Nancy E. (1999). Environmental Science and Technology: Concepts and Applications. Rockville, MD: Government Institutes. U.S. Environmental Protection Agency. "Office of Water Underground Injection Control Program." Available from http://www.epa.gov/safewater .